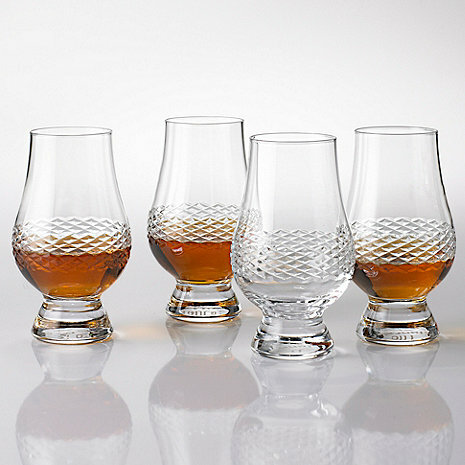 Savor whisky in glasses fit for royalty! After winning the 2006 Queen's Award for Innovation, the Glencairn whisky glass has earned its place on the bar. Considered the "official whisky glass" by the experts, Glencairn offers aficionados of Scotch whisky a special vessel to appreciate its nuances. Comfortable in the hand, it has a full bowl that tapers at the rim to enhance color, body, aroma, taste, and finish. Artfully banded with precise diamond cuts in the glass. Designed for the whiskey connoisseur, this collection is a masterpiece of design. Of infinite perfection, the clean, simple lines are artfully banded with precise diamond cuts in the glass. Exceptionally beautiful new acquisitions for the bar, they are pleasing to the eye and elegant in the hand. Does this glass contain lead? These glasses are lead free. No. The glasses are made from lead-free crystal. What size is this? I've read some reviews on similar products that suggest these are the size of a smallish juice glass and not easy to put ice in. BEST ANSWER: These glasses are 4-1/2 inches in height. Where are the Glencairn Whiskey Glasses made? Also, would they fit the ice balls (as in the "On the Rock Glass and Ice Ball"). Bought these for my husband, he really likes them. I cannot believe that the review has to be a minimum of 50 characters in length. My husband always says I talk too much so you should be happy that my first sentence was to the point. These are glasses, what is there to really say about them. They look like the picture which is what we wanted. Anyone who is bothering to read a review about glasses, deserves to waste their time reading this. These glasses are small and fragile. I was washing one for the first time and it broke due to me filling up a small cooking pot with hot soapy water. Guess I should of used cold water. The glass has a good appearance and you defiantly can smell all the notes of the bourbon. Overall I would say these glasses are not intended to be used as an everyday glass.